Watch ee publishing & productions, llc Archives of Older Product Videos by TDmonthly. Trademarked as the laugh-friendly company, ee publishing & productions writes and publishes children's books, along with developing and promoting nostalgic toys and positive apparel. We are devoted to cultivating the rediscover of children's (and adults) imaginations everywhere and believe that "everything old is new again" in some form or another. We are committed to the community and social change. Our clients, our vendors, and all we come in contact with are important and deserve our total respect, smiles, and laughter -- we are a compassionately strong and focused company. 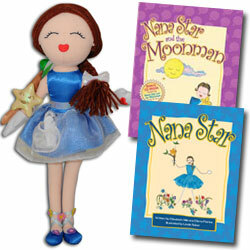 Nana Star - The "Raggedy Ann of the 21st Century" - A classic soft "rag doll" leading a ongoing book series. The story series is about a little girl who finds a lost baby star and their journey together to return the star to its home in the heavens. 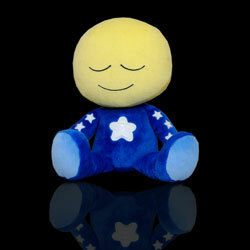 Numerous characters to be introduced all will be introduced in plush toy form. CutiePatooties WannaBe Babies - Kewpie Dolls Get a Job. Collectible, Tradable, Adorable. Created for play, collecting, and trading, each six-inch CutiePatootie pays tribute to a profession from yesterday or today. Every Cutie comes with a removable outfit, a booklet profiling the skills and talents specific to his or her vocation, and a colorful shadowbox depicting his or her workplace environment. The Cuties remind us that toys don’t need controllers, HD graphics, memory cards, or even batteries to help prepare kids for their futures.